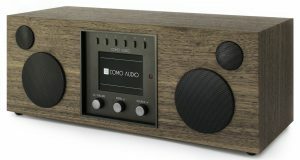 Besides playing CDs, you can explore 30,000 Internet radio stations from around the globe, tune DAB/DAB+ stations (European version), stream wirelessly via Bluetooth with AAC and Qualcomm’s aptX for audio, charge your smart device from the USB jack, listen to sound from your TV using the optical input, connect analog audio equipment using the two auxiliary inputs, use the Ethernet input instead of WiFi, and use the included remote control or the free Como Control app for iOS and Android. 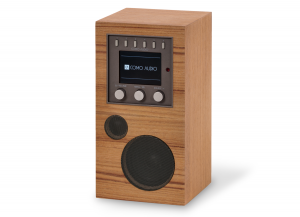 Musica’s 3.2” color display beautifully reproduces Internet and DAB station logos and album artwork. As if all of this weren’t enough, Musica also integrates Spotify Connect, Tidal, Deezer, and Napster premium music streaming services, with Amazon Music to be added in the Fall of 2017. After the setup, listening to music is as simple as pressing one of the eight presets to turn Musica on and tune to that station or source. There’s even dual independent alarms, tone adjustments, and display brightness settings.